Thomas died 16th April 1933 at St Olave's Hospital Bermondsey. The above certificate shows his wife Christiana Jessie Langman was the informant when he died. 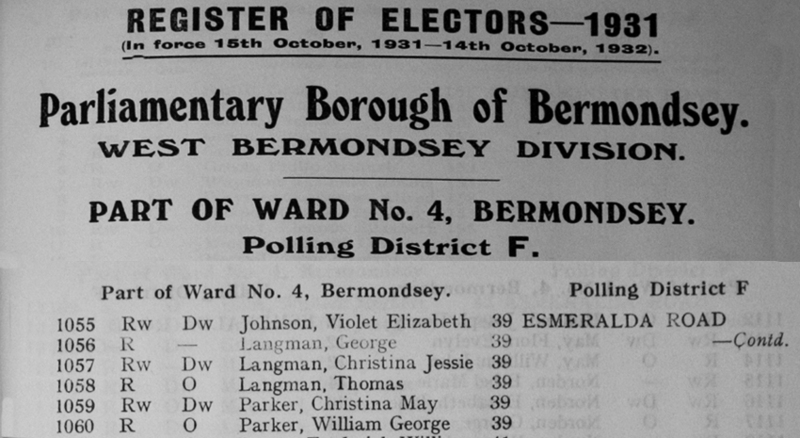 Note that both Thomas and Christiana's address shown is 39 Esmeralda Road Bermondsey where they been living since 1919. Below is the Register of Electors for 1931. The residents of 39 Esmeralda Road are listed as Thomas Langman, his wife Christina Jessie, and their children George and Christina May who was now married to William George Parker. Also resident was Violet Johnson who was probably a lodger.